European Institute for Advanced Studies in Management (EIASM) is an international network for management research and teaching that includes more than 50.000 management scientists from all over the world. EIASM's mission is to enhance high quality in research and doctoral studies in management and related disciplines. The 15th annual EIASM workshop, organized and hosted by Audencia Business School, continues the tradition of successful academic events that have been created at the previous meetings in Jönköping (2005, 2007 & 2012), Nice (2006), Naples (2008), Hasselt (2009), Barcelona, (2010), Witten (2011), Helsinki (2013), Bergamo (2014), Lyon (2015), Zwolle (2016), Bilbao (2017) and Larnaca (2017). The workshop will provide great opportunities for researchers to share their experiences, receive high value feedback on each other’s work and to form new research collaborations. The workshop will consist of plenary sessions and research paper presentations. Family businesses and business families are more likely to pursue non-economic goals for their own satisfaction but also for the benefit of society. Indeed, values held by the family, family members, or family business are often catalysts for entrepreneurial behaviors, leading to the creation of new entities, new business models, responsible innovation, philanthropic endeavors, and responsible supply chain management, among others. What form of entrepreneurship is better suited to address the United Nations Sustainable Development Goals (SDGs)? How does family involvement (in ownership, in management) contribute to sustainable development? How do family relations influence the way (social) entrepreneurs deal with sustainable development issues? How does family identity, family roles, and family values influence entrepreneurial behaviors and the impetus for responsible innovation? How does family entrepreneurship in general motivate entrepreneurs (individuals, families, and family businesses) to behave more responsibly? What are the reciprocal relationships between family, entrepreneurship and sustainable development? How does the family culture influence how entrepreneurship contributes to sustainable development? How do family entrepreneurs enact their social identity as responsible leaders (on the individual, family, and family business levels)? What role do family values play in pursuing sustainable development through entrepreneurship? What are intermediary mechanisms (e.g., emotional, motivational, identity-oriented, role-related, etc.) that influence the relation between family, entrepreneurial behaviors, family business, and sustainable development? In addition to featuring state of the art research papers and case studies, the workshop will offer keynotes. A touristic activity will follow the conference, Sunday morning. Please submit your abstract only through the EIASM online submission system. The proposal is composed by a cover page and the body of the proposal that consists of a 2 pages abstract (cover page not included). - the cover page should be a separate sheet including the following information: Title, Each author’s name, his/her affiliation, address, telephone, fax, e-mail. - the 2 page abstract should include: Purpose/topic of research, Research method, Theories used and Contribution of research. All proposals should be single spaced, 11 point font, Times new roman or similar. * click on "Workshops & conferences / Event administration"
* enter your login and password (in case you have forgotten one of these items, please follow the procedure indicated). - In case the title is different from the title of the abstract you submitted, please modify it. * once it’s done, don't forget to click on the "SAVE" button. The academic programme will start on May 24th, early in the morning and finish on May 25th in the afternoon at around 5 pm. A welcome reception will be organised on May 23rd, late afternoon. The workshop dinner will be organised on Friday, May 25th. A detailed schedule will be posted soon. Special issue on “Responsible Ownership in Family Firms: A focus on the family” in Journal of Family Business Management. Details here. In order to enter the Audencia Building YOU NEED YOUR ID CARD! 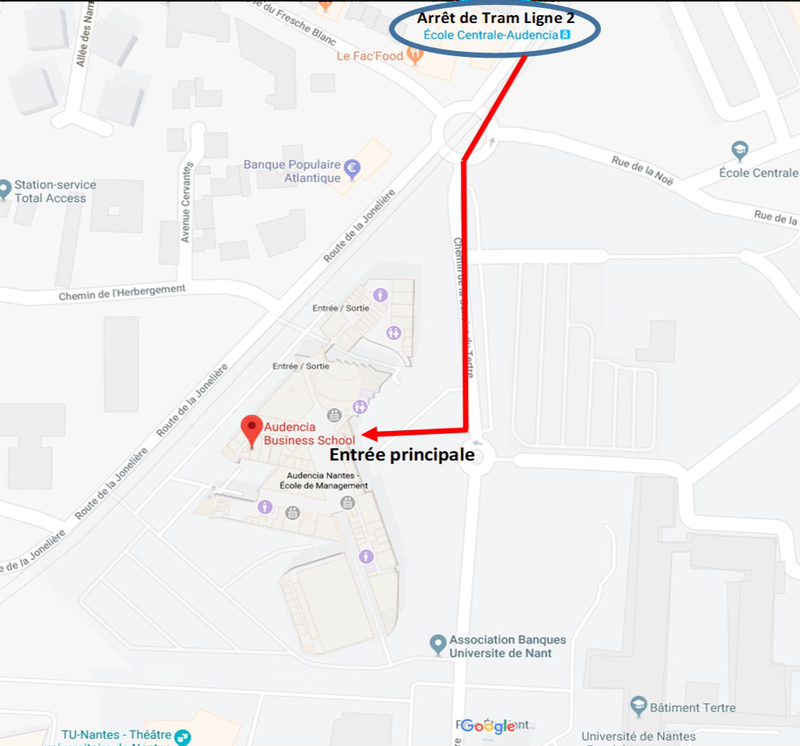 See here how to reach Audencia. List of recommended hotels - Note that during the days of our workshop there is another big event happening in Nantes and we recommend you book your accommodation fast. The fees include participation to the workshop, documents, lunches, the workshop dinner, welcome reception and morning and afternoon refreshments. Cancellations made before April 10, 2019 will be reimbursed minus 20% of the total fee. No reimbursement will be possible after that date.